Product prices and availability are accurate as of 2019-04-20 06:04:24 BST and are subject to change. Any price and availability information displayed on http://www.amazon.co.uk/ at the time of purchase will apply to the purchase of this product. 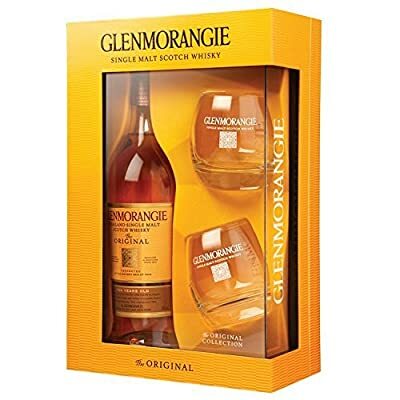 A bottle of Glenmorangie's excellent 10 year old Original, perfect for giving as a gift. It comes in a metal fronted box, showing off the distillery's love of swirly designs, along with 2 branded whisky tumblers. Web-Exclusive Price!